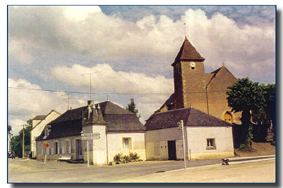 Paray-le-Frésil is a very small hamlet (417 inh.) at about 320 km (200 mi.) South of Paris. The cemetery is next to the church. 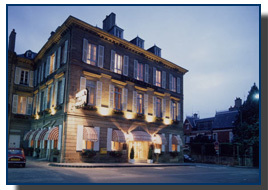 - the inn where Maigret stays and where he meets and talks to some of the people involved. The body is moved on to the backseat of the car and Maigret and the doctor are required to sit in front next to the driver. Vichy When they arrive at the castle and after some tribulations the countess lies in state in her bedroom. Maigret is standing with the doctor on the steps in front of the castle when the son, count Maurice de Saint-Fiacre, arrives in his yellow sports car. Maigret and the count walk in the direction of the main entrance-lane to the castle-park. Coming from the castle, walking on to the main gate of the castle-park the police chief can see the people coming out of the church and he notices the visistors on the cemetery. Earlier when they went by car to the castle with the church behind them, they had the lake in front, the lane to the castle to the left and the inn to the right. 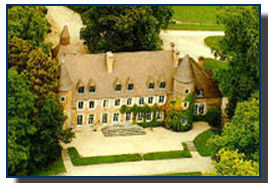 "Le château de Saint-Fiacre" in the novel, is situated at about 500 m from the village-center. 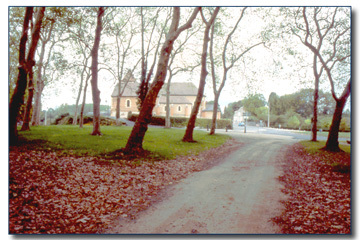 As described in the story a long lane bordered with oak trees leads from the main gate to the building. Worth mentioning is that the front of the castle is oriented away from the main entrance to the estate and therefore from the village. Coming from the castle in the south, on the end of the main entrance-lane to the castle, the church with the cemetery and the village are to the north-west. 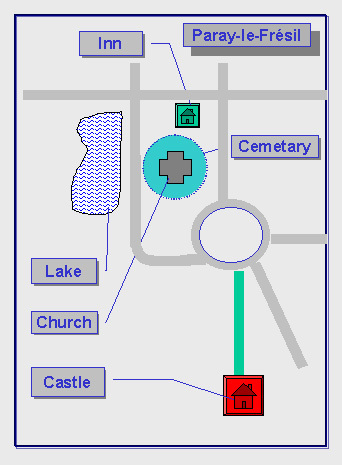 To-day all roads in the village emerge at a traffic circle, as well as the castle's entrance lane. The church is on a small, rather steep, slope, with around it, in a circular shape, the cemetery. Most graves are removed, only some particular headstones are preserved. One of those stones is from an ancestral grave of the deTracy-family. The inside of the church is unaltered since Simenon's time and matches the description in the novel remarkably well. Even the choir-stall in which the countess dies, is at hand. Right opposite the church-entrance is the lake. In the novel it is called "Etang Notre-Dame", in reality it is the "Etang de Bourg". 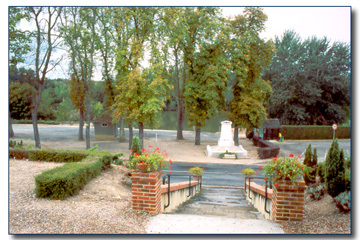 The actual Etang Notre Dame exists but is situated at about 1,5 km south of the village. Coming from the church the Inn of Marie Tatin is not the first, but the second house of the village. 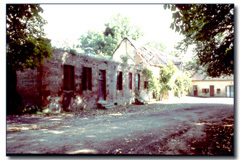 The inn is still there and is now called "Bar-Restaurant Le Retour". 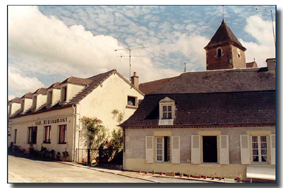 Mister Claude Menguy, well known authority on the work of Georges Simenon, was so kind to send us some photographs from the inn and the church to be used on this website. 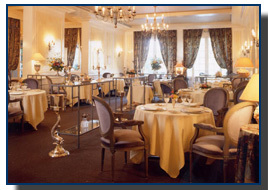 The inn is now called Bar - Restaurant le Retour. The inn is the house on the left with the five dormers on the roof. The church is visible on the background. View on the church from the main-entrance gate of the castle View on the lake from the entrance of the church. The house where Maigret, in Simenon's imagination of course, was born and where his family lived until his father died, represents a problem. 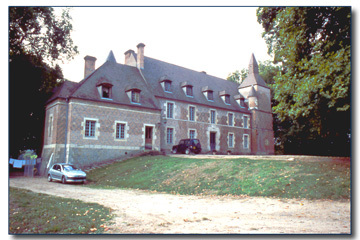 In his article in "Traces N°10", "Simenon: 'sites classés'", Claude Menguy publishes a photo of one of the outbuildings of the castle and identifies it as the birth-place of Maigret. Later on he reconsiders on this theory and in a letter of April 2003, he expresses his doubts about this matter and announces that he will reveal the real position of the house in his next book. Although Simenon lived at this castle for almost a year and must have known very well where the manager's house was situated, one must realize this research concerns no less than the roots of an imaginary character. The problem therefore is not in which house the manager lived but in which house Simenon situated the birthplace of his character, Maigret. 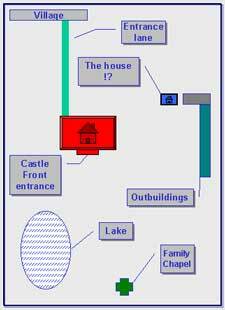 According to this source the house was in front of the castle, to the south, in the vicinity of the old family chapel, which is, like most of the outbuildings also in ruins now. Only the foundations of this house remained. But was this the house that Simenon had in mind? In general Simenon is very diligent when it comes to pinpointing the localities where the stories are set. As a rule he doesn't diverge much from reality, but there are exceptions. During the survey of different localities it could be observed that sometimes he tends to simplify the situation, making things easier for the reader and for the sake of the story. In those cases he abridges the rather complicated circumstances of the real state of affairs. Perhaps this is what he did with the managers's house. "Le château, il le connaissait mieux que quiconque! Surtout les communs! Il suffisait a faire quelques pas pour apercevoir la maison du régisseur, où il était né." "The castle, he knew it better than whoever! Especially the outbuildings! It was enough to take a few steps to see the house of the manager, where he has been born." If the managers's house was, if we are to believe the novel, to the south of the castle, "a few steps" would not have been needed. Standing in front of the castle, turning around would have been enough to see it in the distance. To see the house that was intially identified as the birth-house of Maigret by C.Menguy, this in fact would require "a few steps", because this house is situated slantingly behind the right side of the castle facing the front. So one has to move some distance away from the entrance to see it. "Et il referma la porte derrière la femme de chambre, alla coller son front à la fenêtre, laissa errer son regard sur le parc tout feutré de feuilles mortes et de grisailleé..
Il apercevait à gauche, sous les arbres, le toit rouge de la maison du régisseur. Où il était né. " "And he closed the door behind the chambermaid, went to lean his forehead against the window, let wander his glance across the park felted with death leaves and arid branches. On the left he saw, under the trees, the red roof of the house of the manager. Where he has been born". Actually this quote rules out all other possibilities than the intended house. One can suppose that the bedroom of the most important resident of the castle is looking out over the park in front of the building and over the lake. Maigret is looking to the left. This means the bedroom is situated on the left corner of the castle standing in the building facing the front. All other possibilities lead to a most unlikely situation. The town of Moulins also plays a role in this story, although, not of vital importance to the plot. The Café de Paris is still there. It is situated 31, Rue the Paris and is now called "Hôtel de Paris". - Photo: G. de Croock, Back-façade of the castle of Paray-le-Frésil. - Photos Paray-le-Frésil, Collection of M. Claude Menguy. - Photos: G. de Croock, vieuw on the church and the lake. - Photo: G; de Croock, supposed "managers house"
(3) Georges Simenon, L'Affaire Saint-Fiacre, 1932. Excerpt translated in English by G. de Croock out of the 1984 edition, Presses Pocket, Paris.